Kingsbridge workbench thread dedicated to converting the layout stock to Kadee couplings and in limited cases close couplings (Hornby/Roco) for fix rake coach formations. Hopefully as the thread evolves it will show how I converted coaching stock and goods wagons to Kadee couplings using a variety of methods and couplings from various NEM shank lengths to various types of gearbox Kadees which will be needed to convert my old Bachmann 2 axle wagon stock. Some of this already posted in the Q&A forum but I want to keep a record of all the conversions on the layout here as they occur in the comings months. IRM Ballasts before and after conversion to Kadee No 18s plugged into NEM pockets - gap greatly reduced enhancing the look of a rake. NEM pocket a little high but the kadee's work perfectly within a fixed rake of IRM ballasts or IRM cement wagons and actually 50% overlap the correct height for coupling up to an MM 141 or 071 loco. If I encounter any running issues I may adjust the height of the coupling in the end wagons of each rake for 100% loco height match. Overall though it looks like an easy conversion for my IRM ballast and cement wagons. Converting Murphy Model Mk2d coaches to Kadee - glue alternate no 19 and 20 to underside of NEM pockets for correct height. Close coupling - Orange roof Mk2d have kadee no 19/20 pair per coach, black roof Mk2d have Hornby R8220 close couplers. There is little difference when stationary. Both vastly superior to gaps left by tension lock couplings. Hornby R8220 close couplers. Easy to vertically lift stock out of a rake unlike TLCs and these really do close couple yet can cope perfectly with 1st radius curves. Roco 40270 close couplers seem almost identical but apparently are a little shorter for even close coupling. Will try a set next week. OK change of mind. I've decided I'm not happy to compromise on the kadee height on the Ballasts I converted earlier. Aside from the trip pins being too high for magnets to operate uncoupling, visually the coupler in the NEM pockets are almost the same height as the buffers which visually clutters these lovely models and doesn't look right. I have now followed IRMs advice and glued the kadee no 18 under the NEM pockets. This is much closer to the correct Kadee height gauge. IRM Ballasts after conversion to Kadee No 18s GLUED UNDER the NEM pockets - gap greatly reduced enhancing the look of a rake. Coupling now matches loco heights and other stock on the layout which will facilitate shunting and marshalling. It took a while but I saw the light. I did some running tests today and this coupling distance runs runs perfectly on the layout including on the few short radius Peco streamline points I have. Also tested ok on some spare 2nd radius curves. Happy days. Shows no 18s glued to underside of the NEM pockets. You will need to file off the thin IRM logo on one of the NEM pockets. Matches loco perfectly now so no risk of uncoupling at changes of gradients, or when coupled to other rolling stock. Comparison between using the NEM pockets or IRMs recommended fix of gluing the kadee's to the underside of the NEM pocket. This visually looks much better as the coupling is below buffer height. I'll have to weather all the newly installed kadee's now! It really is worth the time to iteratively trail and error Kadee conversions especially extensive running tests on shortest radius curves on the layout, and with other rolling stock both being hauled and pushed. Will do the same fix with the IRM cement wagons and the ploughs in due course. I understand the Tara's have the NEM pocket at the correct height. PS: Kadee no 17s would only work on vary large radius track and only if also glued under the NEM pockets because they cannot plug into the NEM pocket without removing the lovely cosmetic coupling hook. Close enough. 20yo Bachmann two axle wagons get the kadee treatment. No 148 whisker kadees in draft gearboxs (medium length centerset) have replaced the large old tension lock couplings. The plastic lugs and mounts for the old TLCs were cut off and filed flush with underside of chassis. Now closer coupled than before and they are less obtrusive than the old TLCs (tension lock couplings). Running trials successful across peco streamline code 100 short radius points. The knuckle couplings are far less obtrusive than the 20yo TLCs. Cutaway old TLC mounting lugs and file flat. Note: Bachmann buffers on this era stock are short so the 148 kadee (medium centerset) fits perfectly, but if converting wagons with longer buffers you may need 146 (long centerset). Bachmann tended to produce buffers at a scale length that reflects slight compression when coupled in rakes rather than a standalone wagon where the buffers might protrude more. Above 201 knuckle coupling 65% overlaps with rolling stock (i.e. that is at the correct height). Kadee plier tool above for bending trip pins is a really useful tool. Kadee production line continues as I convert more stock. Kadee no 17s with white NEM shank adapters for Cravens, no 18s for Irish Freight Models TPO + Bulleid HLV, no 147 for Silverfox mk1 GSV + Dutch GSV, no 148 for the Bachmann Wagons, no 18 for IFM Brake vans, and no 19 for 141/181 locos. This has been an interesting project and there is much more to do before all my stock is converted. Next up Park Royals, Laminates, Mk1 GSV (lima conversion), CIE Brake Parcels van (Bachmann conversion) . . . it never ends but isn't that part of the enjoyment. CIE BSK GSV + CIE Brake Parcel Van received the Kadee treatment. The sprung Keen suspended gangways help the appearance, but I guess if I added the Keen system swivelling draw bar to some of my other stock everything could be this close coupled. Bogie mounted couplings simply cannot facilitate close coupling. I get away with it below because the gangways are sprung. The CIE Black'n'tan era never had uniform coach rakes, they were a mix of everything from Park Royals, Laminates, Bredin, Cravens, etc, and any manner of vans for parcels, heating, TPO, etc. So from a coupling point of view it is challenging to minimise gaps when some of the stock have kadee's mounted to bogies, others the coach body, and others the optimal mounted to a swivelling draw bar (e.g. like Bachmann and MM coaches). This 'tool' has been invaluable while converting stock to kadee couplings. It comprises the kadee coupling height gauge mounted on a piece of ballasted track which has been easy to use on the workbench when sizing up potential positions of couplings on stock and bogies. Easy to get down to eye level and it can be picked up. I found it accelerated the time needed to choose which kadee would be the easiest fit for a piece of stock and the simplest way of fitting the coupling (e.g. test hold various kadee couplings with tweezers under stock for dry fit alignment testing). Also useful for stock to stock coupling tests on the bench before trying converted stock out on the layout. Where did you get the sprung Keen suspended gangways? They certainly seem to do the job of closing the gap between coupled coaches. Kadee conversion of IRM ballast wagons continues. Kadee no 18s glued to underside of NEM pockets has worked really well. Comparison below on test track. Top four wagons out of the box with tension lock couplings, the four wagons below have had the Kadee no 18s added. The rake is considerably shorter. Very happy so far with test runs on the layout over short peco points and my tightest radius curves. PS: Looking at these lovely wagons I think I am going to have to bite the bullet and weather them soon, especially the loads. More kadee fettling and adjustments on coaching stock. Reducing Kadee size from no 19 to no 17 in the NEM pockets of these two CIE vans (HLV+TPO) greatly reduced the gaps yet due shortish length still get around bends and across paintwork without fouling or buffer lock. Min radius curves are 3ft, most are 3'6" but surprisingly these also run over the few 'short' Peco points I have. The Park Royals will need more work as I adjust the bar on the commonwealth bogies as they don't have NEM pockets, nor do the laminates. I've been following this with interest Noel. Some really handy info there due to your perseverance to get heights and spacing right. Nice one. 33 wagons and 24 coaches converted so far. Only the cement wagons to do and then I'll take a pause and get back to other outstanding workbench projects. Before starting I had just a hint of scepticism about kadee's, but the more stock I converted and test ran the more pleased I was that I'd taken the plunge. Chart below summarising kadee's current product offerings. Their web site is so confusing and they seem to have gazillions of versions of their products, but the list below may help some. It's not definitive and the choice of coupling lengths suited the 3ft radius curves on our layout. IMHO the 237 trip pin pliers is an essential tool for tweaking the odd wagon or coach where you experience a marginally drooping trip pin (i.e. track snag and derailment hazard). Was very happy how close I was able to couple the old Bachmann wagons below and how 100% reliably they ran after conversion from the old tension lock couplings. PS: One rake of mk2d's was converted using Hornby/Roco but with kadee's at each end of the rake for loco coupling (i.e. I have one fixed rake of mk2d). PS2: Also in the mean time most of my locos have a kadee at one cab end and the original TLC at the other end so I can operate them with converted and unconverted stock. Well, they've all been outstanding so far! Your are too kind sir I've a serious backlog to catch-up on. I was reading over this thread again today Noel and out of curiosity tried a 20 in one of my Bubbles. Not that i was doubting you, but because I have a lump of them spare.Your spot on with the 18s as the 20 is basically the same length as the tension lock when plugged into the NEM. So as you've suggested above I'm going to glue the 20s to the underside of my Ballasts to use them up and invest in some 18s for my Bubbles. 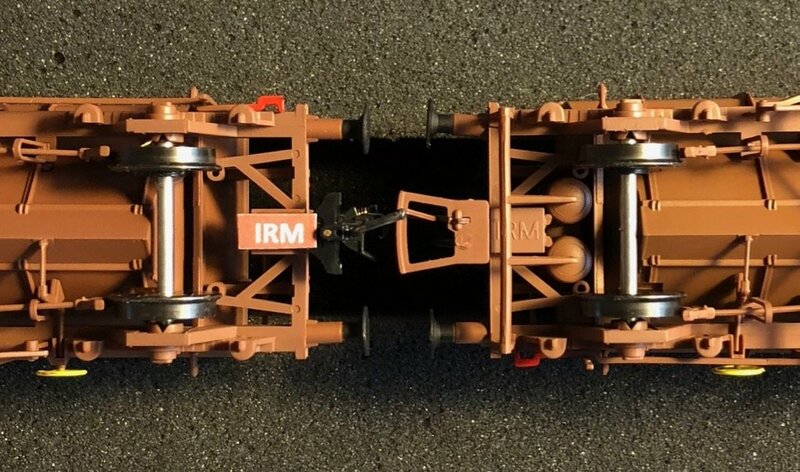 You'll need to file the IRM logo flat under one NEM pocket per wagon. Fear not Sir Richard - the IRM logo was replaced on top after gluing on the kadee. Lest this wagon appear on BBC antiques road show around 2170 as a sample of outstanding early 21st century model manufacturing - its provenance will surly be known and bound to fetch quite a few guineas at auction. I was asked on a kadee coupling Q&A thread over on RMweb what glue I was using to fix the couplings to the underside of wagons and coaches rather than screws, in situations where NEM pockets were not available or unsuitable. So far "Deluxe Materials Rocket" super glue has worked well with a great variety of plastics from the soft shiny stuff Hornby used in the 1970s, ancient Lima plastics, to recent production Bachmann wagons, and indeed IRM ballast and cement wagons. I usually rub down the surfaces and the side of the kadee shanks or topside of draft gearboxes before gluing with a micro file or fine sand paper. So far I have found it more efficient and faster than drilling and screwing. Nothing has fallen off so far after converting about 60% of my stock and extensive running. I'd nothing to lose by trying glue, having screws as a fall back alternative had the glue not been effective. Below, Bachmann Y25 bogies converted to Kadee couplings. Video demonstrating uncoupling wagons using compact rare earth magnets. The magnets are a fraction of the size of kadee's own magnets and are easy to install. They are cylindrical 5mm diameter and 6mm long. A pair are required offset each side of the track centre line. The magnets need to be almost need to be flush with the sleepers because they are so powerful they would pull the wagons upwards if they were flush with the top of the rail. Much easier to install and hide then kadee's own magnets. Cost €3 + €4 postage for twenty magnets = 10 uncoupling points at a cost of 70 cent each. I will install on the layout as I reballast sections of track. Before I got them I thought I might have to double them up (i.e. 2x6mm = 12mm deep), but they are so powerful one 5mm x 6mm magnet each side was enough and I had to recess them more than I'd expected to avoid the kadee trip pin being pulled downwards towards the magnet causing the other end of the wagon to lift off its axle. One of the things to bear in mind is if the magnets are not carefully placed could cause wagons to jerk (i.e. if the metal wagon axles and trip pins are too close to the magnet surface). NMRA standards advise that typical 2 axle wagons should have a minimum weight of 40-70grams which reduces unwanted movements. Put a kadee 321 magnet on the layout for DCC uncoupling trials using WheelTappers DCC sound project for 141 using function 12 'uncoupling'. F12 automates the loco movements with uncoupling sounds as the kadees release and the loco backs off. It will also automate coupling movements with appropriate sounds (i.e. brake hiss, air, engine, etc). Some nice work there, Noel. Just wondering, do you have any issues when mixing and matching NEM Kadees with the regular draft box Kadees such as the 146's? I found that sometimes the two different types didn't "play nice" when pushing stock over points and tight curves and especially when using delayed uncoupling. Crossovers in particular can be a nightmare! I also tried using neodymium magnets instead of Kadee's magnets but also encountered problems where the neodymium magnets where too strong and would pull the couplers too far to the side so the couplers heads would miss each other when trying to shunt. Again, this is mainly a problem with propelling stock into sidings etc. To be honest I'm tending to pull away from using the NEM Kaddes, preferring to body mount the draft box type where possible. I'm working on a way to fit the draft box to MM 141's but it may involve a lot of surgery! The very definition of railway modelling, if I ever heard one! Hi Graham. Apologies for delayed reply, have been away so missed a lot of posts and only saw this tonight. Interesting question. To summarise I don't seem to have experienced issues so far with a mix. I've fitted draft gear box kadee's to all my old 2 axle Bachmann wagons, but NEM kadee's glued to the underside of the NEM pockets on my IRM ballasts and bubbles (i.e. for correct height). NEM kadee's on the dapol chassis 3D wagons (i.e. single beet wagons), and on the 3D 20ft container flats. But my locos are NEM fitted so coupling them to the draft gear boxes on the bachmann 2 axle wagons is the only place there is a mix (excluding coaching stock). On the coaching stock the MM Cravens have NEM kadee's but the coaches they are mixed with such as the IFM Park Royals, Laminates, GSVs, TPO, CIE Brake Parcel van have draft gear boxes and no probs so far. One rake of MM mk2d have NEM kadee glued for height correction, whereas the other uses Roco close couplers. I seem to do most marshalling and shunting with the converted Bachmann 2 axle wagons which are all draft gear boxes. But I'd guess coupling/uncoupling wagons mid formation is only about 80% successful, most probably due to the fact I have not weighted the wagons sufficiently as per NMRA guidelines (i.e. some wagons too light). The 2 axle beet wagons are the worst offenders so I will have to add lead to them via false floors or loads. I was finding that uncoupling was hit and miss with the NEM Kadee. The coupler head has very limited movement compared to even a short shank draft box coupler and when they did uncouple I found they would often RE-couple when trying to shunt the wagons/coaches to another position on the track. The coupler heads just didn't move far enough to stay uncoupled. I also noticed the combination of bogie mounted NEM couplers and body mounted couplers is prone to derail when pushing the stock back over crossovers, especially when using bogie stock like coaches or container flats. That has disappeared when used draft boxes. Scanning through various forums in US and RMweb in UK, and youtube it seems converting rolling stock to kadees often also requires the addition of weight to wagons as per NMRA guidelines if shunting, uncoupling and re-coupling is to be a constant success. A classic symptom is when two light wagons are slowly shunted together one wagons coupler pushes the other wagon backwards without the couplings reengaging because the wagons are too light, or worse there is a bounce effect. Scale mass! The main cause of that "bounce effect" is that the wheelsets on UK stock are being attracted to the uncoupling magnet. It's the axles that are at fault, Bachmann and Hornby use a magnetically attractive metal in their axles. US manufacturers make a point of manufacturing non magnetic wheelsets. It really only happens with the large undertrack magnet as it's long enough that the couplers are still pulled to the side just as the wheelsets roll over the magnet and you get a small jerk which separates the stock. Bloody nightmare! I'm actually in the process of switching out the undertrack magnets for the ones that slot between the rails. If you use small neodymium magnets you won't have this problem either as the "magnetic footprint" is tiny. I've done something similar with this brass strip but the drag really builds up over a rake of 6 or 7 coaches! Thanks Gerry. I might try that as an experiment with some wagons, but have some concern about the friction that might cause with a 12-15 wagon rake.